(Nanowerk Spotlight) Notwithstanding the tremendous amount of research that has gone into the field of carbon nanotubes, the synthesis of single-walled carbon nanotubes (SWCNTs) with controlled chirality still has not been achieved. Current production methods for carbon nanotubes result in units with different diameter, length, chirality and electronic properties, all packed together in bundles, and often blended with some amount of amorphous carbon. The separation of nanotubes according to desired properties remains a technical challenge. Especially SWCNT sorting is a challenge because the composition and chemical properties of SWCNTs of different types are very similar, making conventional separation techniques inefficient. Using the concept of cloning, scientists in China have discovered an effective method to synthesize any special (n, m) indices SWCNTs. 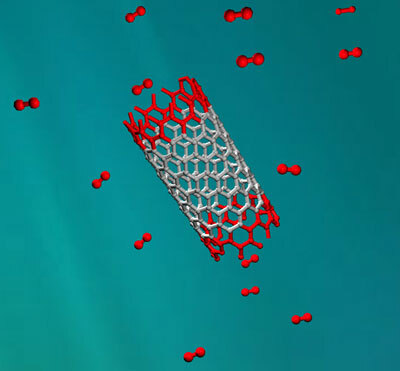 "We found that an open-end single-walled carbon nanotube, which served as seed, could be continual grown via an open-end growth mechanism," Jin Zhang tells Nanowerk. "The new 'cloned' SWCNTs and the parent tubes – the 'seeds' – have the same chirality." These findings by Zhang, a professor of chemistry and molecular engineering at the Beijing National Laboratory for Molecular Sciences, and his colleagues Zhongfan Liu, Yagang Yao, Chaoqun Feng, will be not only helpful to understand the formation mechanism of single walled carbon nanotubes, but also turn the controllable growth of SWCNT with identical chirality into reality. Moreover, this growth mechanism might be an effective way for cloning of graphene from small graphene sheets. Furthermore, large scale cloning of single chirality SWCNT could lead to practical applications. The scientists reported their findings in the March 13, 2009 online edition of Nano Letters ("'Cloning' of Single-Walled Carbon Nanotubes via Open-End Growth Mechanism"). For their technique, Zhang's team first grew ultralong (several tens of micrometers) SWCNTs on SiO2/Si substrate. The nanotube length is only limited by the substrate size, the hot zone of the furnace, and the growth time. Then, the ultralong SWCNTs were cut into short segments by electron beam lithography (EBL), oxygen plasma ion etching, and lift-off, which could be served as seeds/catalysts and the stencil in the second growth. In a third step, the SWCNT 'clones' were grown from the open-end parent SWCNTs by putting the open-end seeds in a chemical vapor deposition (CVD) furnace to first get rid of -COOH and -OH at the end-functionalized SWCNTs, which could help expose the active open-end, and then, by introducing CH4 and C2H4 carbon source. "The cloned nanotubes usually grew as much as a few micrometers in length and the longest length of amplified growth was 4.6 µm" says Zhang. "We thought that if the second growth is not constrained by the substrate such as the open-end SWCNTs are suspending, the new SWCNTs will grow longer." While this strategy works in principle, the growth efficiency of cloning and the exact open-end growth mechanism are problems which still need to be solved. "We have measured more than 600 short seed segments and found the yield of cloning is relatively low, around 9%" says Zhang. "This yield can be greatly improved up to 40% by growing SWCNTs on quartz substrate." The key point of SWCNT cloning is to verify the duplicate SWCNTs have the same chirality of the parent SWCNTs. Through atomic force microscopy and micro resonance Raman spectroscopy characterization the team determined that the parent nanotube and the duplicate nanotube had the same structure. According to Zhang, the open-end SWCNT catalyst (seed) is more suitable than other reported catalysts for the growth of SWCNTs. "Firstly, it can not congregate at high growth temperate. The metal catalyst nanoparticles usually congregate at high temperature which will widen the diameter of SWCNTs grown by them. Secondly, carbon radicals will directly add to the open-end and thus the chirality of new cloned SWCNTs will have the same structure as the parent SWCNTs. Thirdly, our results support the idea that nanosize structures might act as a template for the formation of SWCNTs."